The 3-year-old migrant Syrian boy whose dead body was found on a Turkish beach when his boat sank was identified Thursday as Aylan Kurdi. The heartbreaking photograph of Aylan, dressed in a red T-shirt and sneakers and lying face down in the surf, ran on front pages around the globe and on social media. 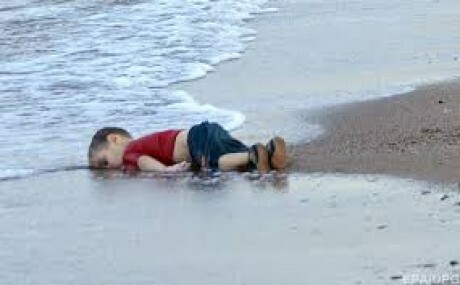 It made the toddler an instant poster boy for the refugee crisis caused by the Syrian war. Aylan, his 5-year-old brother and his mother were from Kobani. They were among 12 Syrians who drowned when their boat sank after leaving Turkey for the Greek island of Kos. Aylan’s father survived. He could barely speak as he displayed more pictures of his sons Thursday — carefree, smiling and posing with stuffed toys. He told reporters that all his dreams had been smashed. Hundreds of thousands of migrants from Syria, Afghanistan and Iraq have been taking desperate steps since January to try to reach the European Union, seeking to escape war and poverty. Greece and Italy have been the first stops for many of the migrants after they made the dangerous trip across the Mediterranean Sea. But many still find no sanctuary after arriving in Europe. Hungarian police on Thursday fought with hundreds of migrants who refused to leave a packed train on its way to Austria. Many said they did not want to be dumped into a migrant camp. The police order to leave the train was unintelligible to many of the refugee families, witnesses said. Some jumped off the train and lay across the tracks, while others simply tried to run away. Groups of the foreign travelers chanted in Arabic, “No camp!” and “We will not move from here!” Pushing and shoving between police and the migrants turned into scuffle, witnesses said, and Hungarian authorities later barred journalists from the scene in the town of Bicske, aboput 40 kilometers from Budapest. The migrants aboard the train, many of them impoverished and hungry, were only a minuscule part of a flood of up to 500,000 refugees bound for Europe, according to the president of the European Parliament, Martin Schulz. Altogether, this year’s flood of refugees from Syria, other Middle Eastern countries, parts of Africa and Asia is seen as the largest mass movement of humanity in Europe since World War II. French, German and Italian leaders said Thursday that there must be a compulsory and fair distribution of refugees across the EU. Schultz said EU member states, with a total population of over 500 million, could absorb large numbers of refugees without any problem, as long as arriving migrants are not concentrated in only a few countries. Hungarian Prime Minister Viktor Orban appealed for assistance at a meeting in Brussels with Schulz and other European leaders. He complained that Germany had complicated the refugee situation by signaling it would open its doors to the migrants, thus indirectly encouraging them to circumvent European regulations in Hungary and other states. The 28-member EU plans to hold emergency talks on the refugee issue on September 14. Persian New Year Сelebrations Сross the U.S.